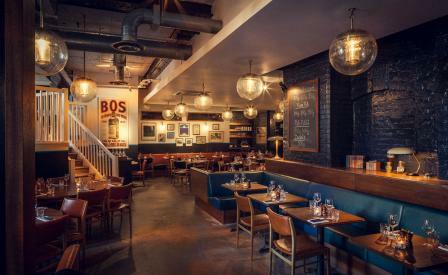 Not content with redefining the British steakhouse with their all-conquering Hawksmoor franchise, restaurateurs Will Beckett and Huw Gott turned their attention to more casual fare with the first Foxlow in London’s Farringdon in 2013. Fast-forward two years and the restaurant’s success has produced a trio of sister eateries, including their newest, set in the affluent West London neighbourhood of Chiswick. Situated in a former 19th-century wallpaper factory, the open-plan space has been imbued with a new lease of life by restaurant specialists Macauley Sinclair, who have enhanced the building’s original features with vintage and salvaged materials, with lights reclaimed from sources as eclectic from the Detroit factory to the Ministry of Defence, while stained wooden tabletops and teal leather banquettes play host to the kitchen’s impeccably sourced range of dishes. While vegetarians will be pleasantly surprised, carnivores are obviously the target audience with meat purchased from acclaimed butchers The Ginger Pig and seafood from Brixham fish market. The beef shortrib with kimchi is hard to pass up, but we’d be just as likely to visit for the restaurant’s Sunday roasts and legendary brunch, topped off with a cocktail from the excellent bar.